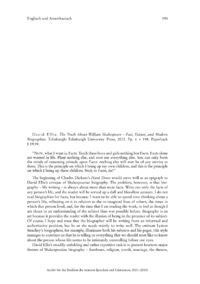 The beginning of Charles Dickenss Hard Times would serve well as an epigraph to David Elliss critique of Shakespearian biography. The problem, however, is that bio - graphy  life writing  is always about more than mere facts. Write out only the facts of any persons life, and the reader will be served up a dull and bloodless account. I do not read biographies for facts, but because I want to be able to spend time thinking about a persons life, reflecting on it in relation to the re-imagined lives of others, the times in which that person lived, and, for the time that I am reading the work, to feel as though I am closer to an understanding of the subject than was possible before. Biography is an art because it provides the reader with the illusion of being in the presence of its subject. Of course I hope and trust that the biographer will be writing from an informed and authoritative position, but he or she needs mainly to write well.